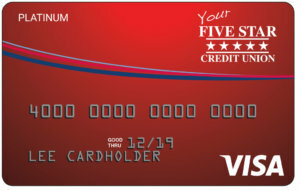 With a Five Star free checking account, you can also receive a free Visa debit card. This makes your transactions easier plus you can use it at many of the surcharge free ATMs in Alabama, Georgia, as well as across the country. To see if you qualify for a Five Star Platinum Visa, stop in your local branch or call the Five Star Member Care Center at (888) 619-1711 (option 2). Rewards Members: Five Star discontinued its rewards program, but if you have points that still need to be redeemed, you can up until Dec. 31, 2019. Go to the Five Star Dreampoints website to redeem for cash, gift cards, or merchandise. Just click the button to begin redeeming your points. Make sure to redeem before the end of the year. If you have lost your card or it has been stolen, please call 855.847.2023. **Annual percentage rate (APR) is based on your credit score and credit worthiness. Introductory APR applies to retail purchases for first six months. After that, your APR will between 9.74% and 17.99% based on your credit worthiness. It will be reevaluated and may vary annually within this same range, based on your credit score.